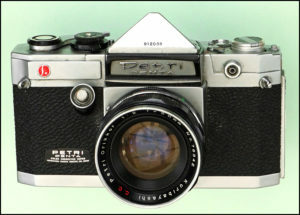 Vintage Petri cameras are cameras made by the Kuribayashi company. Founded in the early part of the 20th century, the Kuribayashi Camera Works were making cameras shortly after the end of WW1, adopting the Petri brand name around 1948, when a series of 35mm rangefinder cameras were introduced. 1959 saw the introduction of its SLR range. 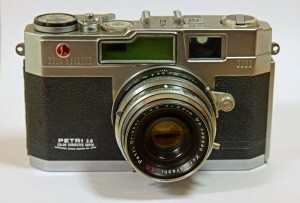 The company was bought out by Cosina in 1978. In general, the rangefinder models are considered nice machines, the SLRs less so (although the later Cosina ‘GX’ models are workmanlike). Petri’s first SLR (indeed the company wasn’t called Petri at this time – they were still called Kuribayashi), the original Petri Penta was replaced in early 1960 by the ‘improved’ Petri Flex, which used a proprietary breech / bayonet lens mount.